I haven’t blogged for the last couple of days, because of a not-so-fantastic combination of being extremely busy and sick. Last Thursday I had the first Geek Dinner I in part had organized (meaning I was “working” for most of the evening) and then last weekend I attended BarCamp London 4. Added to that, I caught some bug at the Geek Dinner, so since then I haven’t been feeling that well, spending Friday, yesterday and today in bed. 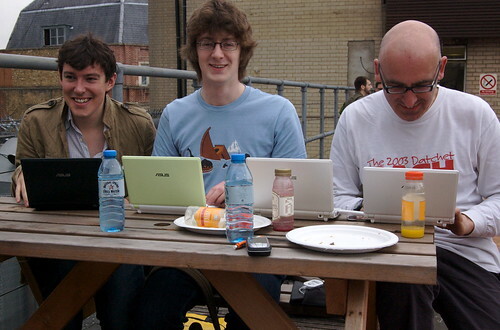 Despite being sick though, I had a great time at BarCamp London 4! With all the fuss surrounding the sign-up for this BarCamp, I was going in with my fingers crossed hoping it would turn out to be a good BarCamp. And it was. There were some minor “glitches” which I’ll come back to later, but overall it was a great experience. 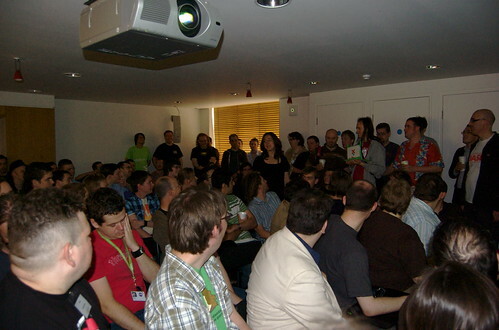 This time it was held at the GCap offices in Leicester Square and was organized excellently by GCap’s Ross Bruniges. I’ve split this post up in two parts (this doesn’t necessarily mean though Day 1 and Day 2), cause it just got too long. So last Saturday morning together with Cristiano and some Dutch friends who were specially here for BarCamp (Reinier, Martijn and Joost) I made my way to London’s cinema center. We were there quite early (9ish) to first grab some breakfast at a small cafe near Leicester Square, meeting up with Simon and Kevin. Completely satisfied by a yummy traditional English breakfast, we then headed to the GCap building, where the BarCamp magic (well, the registration at least) was about to start. After registering, we found much to our delight that the venue had a roof terrace and spent the next hour waiting there till the intro talk began. As always we got a general dos and don’ts speech (“fires are bad”), a thank you to the sponsors and the “every single person in the room introduces themselves”, which takes like forever. After the talk, lunch was served and everybody got to fill in the session boards. Osmosoft sponsored the lunch, a great batch of Pret-A-Manger sandwiches and salads. I decided to do my talk in the very first slot, getting it quickly over and done with. Btw, I won’t write about every single session I went to; just the main ones that stood out for me. I went to this session expecting a demo of an event manager, which for me was interesting with Cristiano having just created his own event manager for the Geek Dinners. Instead though it was about gathering people together who are all interested in helping on an open source event manager. There wasn’t anything implemented yet; it was about how a general “use for every type of event” solution could be created. If you don’t know what Faceball is, check the official website out. The main idea is to hit the other person in the face with a pink or blue Flickr ball (don’t worry they’re very soft). I wasn’t planning to participate, but after seeing all the previous people play, I wanted to know for myself how difficult it was. Surprisingly though, while I didn’t win (Cristiano beat me in the semi-final), I did get the highest score! I’ve got a bunch of Faceball photos up on my Flickr and the video of it here, only the grand finale is missing. Cristiano won though and got us two Flickr pro accounts. This was a great (and pretty) presentation from Cennydd on what beauty is and how we should attempt to create beauty in websites. He showed a couple of great examples of how art is perceived and how beauty really is in the eye of the beholder. My short description doesn’t do it justice and I wished I had recorded this, although sometime this month podcasts should be coming out from all the sessions. For the mean time, check out the slides on SlideShare. The rest of this blog post will follow tomorrow or sometime later, once the videos become available. To check out the videos we already have, head over the Vimeo BarCampLondon4 Channel. I’ve also got more photos up on Flickr.